Soft and Gentle on Baby's Delicate Skin! 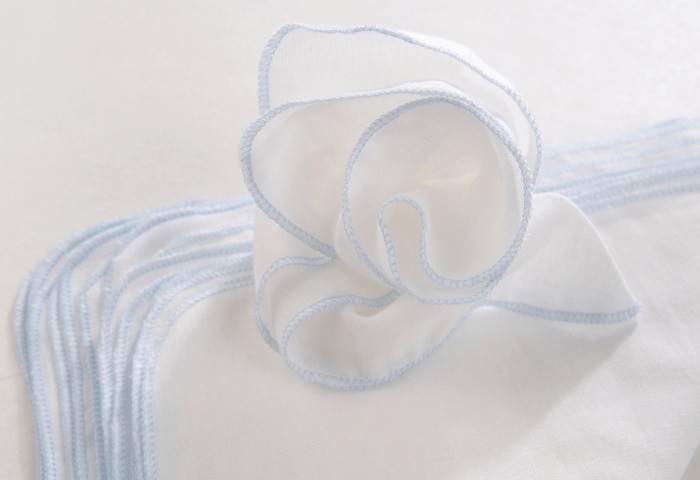 Featuring a 100% cotton muslin fabric that provides softest and gentlest touch! Baby muslin cloth wipes are comfortably soft and absorbent It is so comfortable and safe to use without scratching or irritating baby's delicate skin, even those with sensitive skin or allergies! They are versatile and multi-functional too! Muslin cloth wipes are perfect for diapertime, bathtime, blowing little noses, napkins, kids lunch boxes, removing make-up, or for messy hands and faces while at the same time saving our planet by reducing wastes. To purchase online, please click on ADD TO CART button, then choose your color option. Baby Cloth Wipes - Soft & Gentle on Delicate Skin! Size (25cm x 25cm). Fabric blend (100% Cotton). Cloth wipes clean more effectively than disposable baby wipes - Cloth wipes made of muslin fabric can really grab poopy mess very well, unlike disposable wipes that just seem to smear around! Cloth wipes produce far less solid waste than disposable baby wipes - Babies go through about 6000-8000 diaper changes from birth to about age three. If you use two wipes per change you are throw away over 12000 to 16000 wipes. Imagine all that in our landfill! Cloth wipes clean baby up without unnecessary chemicals - Cloth wipes are free from the chemicals found in most commercial baby wipes as you'll be able to control the solution you want to use to cleanse your baby. The presence of a chemical fluid in common wet wipes has tendency to cause skin rashes such as red patches of swollen, blistering, and cracked skin! Cloth wipes are more gentle on baby skin - Cloth wipes are softer and non-scratching on baby’s bum compared to rough and paper like disposable wipes. Since disposable wipes come pre-moistened, you might be wondering, “How do I wet these wipes?” It is very simple, just pour some clean water over your dry wipes, gently squeeze out excess water and then store them in a closed container. Cloth wipes are convenient and easy to handle, they are suitable for both caregivers and at home moms! After use just toss it in a pail or waterproof bag until washing time. You do not need to rinse the used wipes when you are away from home. You can just rinse and wash it at the end of a day. HOW TO WASH CLOTH WIPES? You can simply wash your cloth wipes right in your regular cloth diaper laundry – no need to separate! ​If you’re already using cloth diapers, than really, adding cloth wipes to you cloth diaper routine is no more trouble at all! HOW MANY CLOTH WIPES DO YOU NEED? This depends on if you're using cloth wipes full time or part-time, but a good average number to have is about 15-20 wipes. This should gives you the right amount of wipes for full time use with factor in the laundry and drying time. Even if they are washed and still damp on a rainy day, they can be used! You can start with less and add more if you find you need more. These re-usable wipes are something every parent or daycare provider should have. My baby was using supermarket bought wet wipes, it irritates the little one's bottom. Then I tried using wet paper towels to wipe him, but it was not a good idea, the paper break apart and create a big mess. I found BambooLite re-usable wipes when I search online. The material is soft and absorbent. When they are dry, they are very absorbent for spit up or spill clean-up. When they are wet, they clean up poo mess very well. In most cases only one piece will clean up baby whole bottom. I have also set some of these aside for wiping little faces. Simply love this!